For almost 100 years, communities along the Great Miami River have been protected by a system of dams and levees built by MCD. The system is an engineering masterpiece. Since their completion in 1922, the dams and levees have protected riverfront communities from Piqua to Hamilton with a 100 percent success rate! To maintain and properly operate this system, MCD needs accurate and up-to-date information about river levels and how weather will impact the Great Miami River and its tributaries. 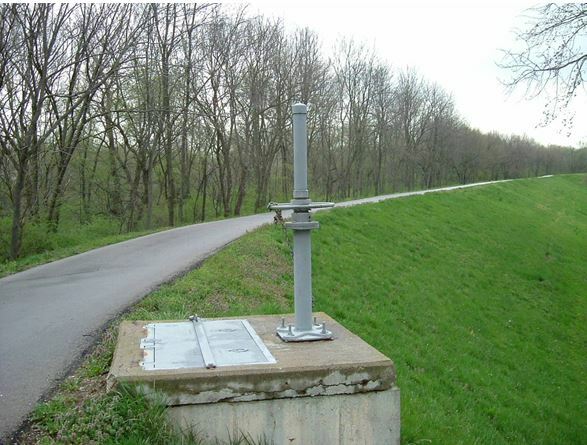 Stream gage at Franklin – The gage is mounted to the side of a bridge over the Great Miami River. The gage uses a radar sensor to measure the distance to the water surface below. MCD and United States Geological Survey (USGS) collect information at 25 locations along the river. Each location features a stream gage that collects river flow information. These stream gages are part of a national network of stream gages maintained by USGS. Stream gages are located along the Great Miami River in most of the cities MCD protects. The gages transmit hourly information on the amount of water in the river channel (elevation or height of water surface in the river). MCD staff uses information from the stream gages during high water events to determine when to close flood gates, measure groundwater levels beneath levees, and inspect levees for signs of erosion or underseepage caused by high river levels. MCD’s stream gage information also is used by the National Weather Service, recreationalists, and businesses and contractors working near or in the river channel. MCD floodgate in Miamisburg – The wheel at the top of the concrete box closes the floodgate below to prevent river water from flowing into the landward side of the levee. Closing flood gates is one of the most important tasks MCD staff does during a high water event. Floodgates are normally left open so that runoff from city streets and parking lots can flow through the levee and into the river. When the river rises high enough, however, water can flow backwards through the floodgate and into city streets, threatening to flood areas protected by the levee. MCD staff close floodgates to prevent this from happening, and timing is critical. 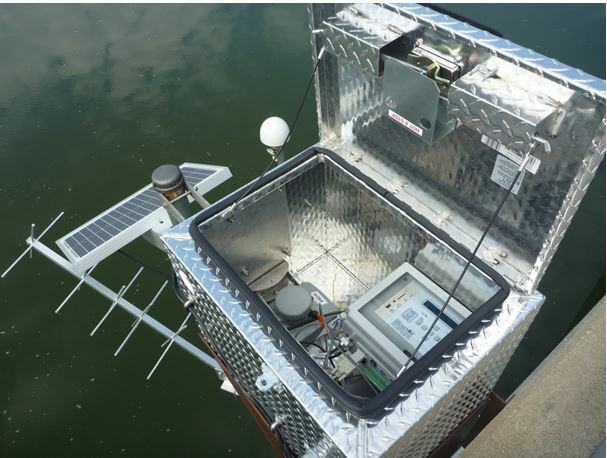 The National Weather Service’s Advanced Hydrologic Prediction Service (AHPS) uses MCD’s stream gage information – along with other vital data – for its daily river forecasts, which are available online. AHPS incorporates information from stream gages and weather forecasts into models that predict future river flows. River forecasts wouldn’t be possible without stream gages. Timely river forecasts allow MCD to plan ahead and take actions necessary to prevent communities from flooding. Knowing current and predicted river levels is integral to operating MCD’s flood protection system. Our region is fortunate to have a stream gage network that provides this critical information. In a future blog I’ll talk more about how stream gages work.